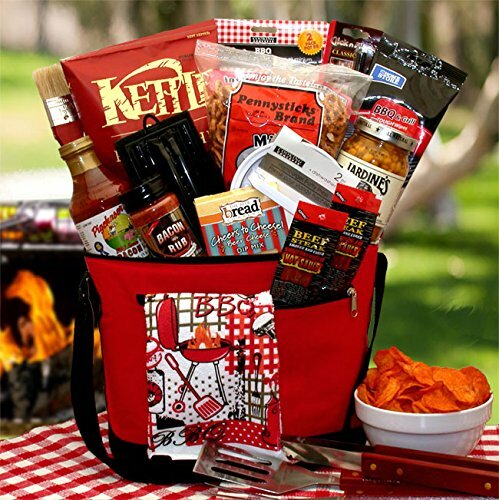 Set your favorite griller up this barbecue season with a gift set featuring Classic BBQ Sauce, barbecue kettle chips, beer cheese dip, flammin hot Smokey beef steak jerky and other gourmet goodies. They'll be ready to roll on the grill right now and straight on through the summer! This unique grilling BBQ gift chest includes: - 12 Pack reusable cooler bag - Cheers to cheese beer cheese dip - Flamin hot beef steaks - Jardines Corn relish dip - Smokey sweet barbecue sauce - Bacon rub spice - Barbecue kettle chips - Pennysticks pretzel twists - BBQ grill wipes - Stick lighter - Hamburger patty press - Basting brush - Cotton hand towel - 2 Mini barbecue grill mates for grilling vegetables or smaller meats - Hand towels are assorted designs and may not all have a BBQ theme. Awesome!